Libraries and Library Blogs: Are You Visible Enough? Even though I love the Internet that does NOT mean we should allow physical books and libraries to go the way of the DoDo bird. We NEED libraries and some people need to have a physical connection with mentors and peers. Libraries are no different than businesses or events – they must be promoted and have visibility or people won’t even know they still exist. We have some serious work to do because today’s college students don’t know librarians are research resources. Some can’t even FIND the library! Librarians in the northeast U.S. have been using a unique method of promoting summer reading programs that I believe would work just as well for promoting how to use the library for research during the school year. Sixty-two libraries have hired the Comedy Magician and Educational Entertainer for Kids Domino the Great who uses humor, magic tricks, and audience participation to get kids excited about books, reading, and their local library. This is the kind of promotion that is necessary to bring young people into libraries at a young age to show them how books and librarians can benefit them. Few children will seek you out themselves – you MUST bring them in – and hiring someone like Domino (@DominotheGreat on Twitter) is one way to do it. Do YOU have other ideas? Strategies that have worked for your library? Please do share them in the comments of this post and I will move them up into this section. Relevant links are ALWAYS welcome here so do please include links to blog posts, media and any other additional information. HURRICANE IRENE DAMAGE: Several libraries have lost their entire children’s book collections in Hurricane Irene. They are seeking donations of cash and new hardcover children’s books – especially picture books. See Upstate New York Library Needs Our Help and After Irene: A small town Adirondack Library Needs Your Help. To get added to this section leave a comment with link(s) to additional information in the comments of this post. Many librarians have been blogging for years now and just as I encourage collaborations of bloggers by niche and location, librarians can seek out bloggers geographically close to them. To that end I offer these lists of Library blogs. Where possible I have included a location. Librarians who blog either officially or personally are invited to add links to their blogs with a description and their location in the comments to be added to this list. Note: If the text is unlinked that library blog has disappeared since the last time this list was manually updated. This is the BlogwithoutaLibrary.net list of public library blogs as of Oct. 6, 2011 edited to remove dead links and inactive blogs. Visit their site for the most current list of public library blogs. If you know of a public library blog that is not on this list, you can add it to their site and leave a comment in this post to have it added here. Frisco Public Library – Un-Shushed! Logan Library – Check It Out! Morton Grove Public Library (IL) – Did You Know? Mount Prospect Public Library (IL) – Check It Out! Newport Public Library, Newport, RI – Kids Speak Up! Newton Free Library, Newton, MA – What’s New in Newton Reference? North Canton Public Library – blog this! Peabody Institute Library, Danvers – Read This! Perrot Memorial Library Blog, Old Greenwich, Connecticut, U.S.A. Prince Edward County Library – Teen Room events! Saxton B. Little Free Library, Saxton Reads! Washington County Public Library (Va.) Literary blog: why should books be boring? ARSL ~ Association for Rural & Small Libraries, Inc.
A lot of my friends go for eBooks nowadays. Those are free and they wouldn’t have to carry around heavy books. But I was thinking, library books are still free, right? And bringing a book is still better than brandishing your iPad, iPhones or any device you got to the world. And libraries are also good place to research. I’m a magician so I definitely need the knowledge about magic and even some distant but relative topics. As the internet grow its popularity in our society people forgot that there is a place named LIBRARY. I know that there are many educational resources available online but libraries should not die because not all of the materials we get from internet are reliable. Some information are not accurate. Yea having someone like me (Comedy Magician 4 Kids) to entertainer your kids during your summer reading program helps get them excited about reading. When they watch the magic show and then see how I incorporate reading into my shows, the kids can’t wait to check out books afterwards!! Just check out this past summer’s library reading show. It’s great to hear that Librarians are finding ways to promote reading books. It’s kinda tough to encourage teens to read printed books because they mostly prefer to read them online. Thanks for sharing the list. I’ll visit them, swear! I’m glad you posted this. With the rise of the number of people, many have access to the internet and don’t see a need for the library. However, there are still lots of people who don’t have access to a computer to get on the internet. Also there are a lot of books and information that you can’t find on the internet, and there is also a lot of misinformation and non-credible sources on the internet. Libraries are great, and should stay around for a very long time. They provide more services than just being a place that has books. With the availability so many online resources, do you think that the library will die, or will is just move online? Libraries are great resources, but how can we progress them and make them available to more people? Hugh Kimura would love you to read ..Do You Make These 5 Mistakes When Trying To Make Money? I don’t think libraries will die; they’ll simply evolve and incorporate all these new online resources and e-reader devices. A lot of libraries throughout the US will now lend to your Kindle, Nook or Sony eReader. Libraries, in some form or the other, will always be here to stay. There is nothing that can offer so much knowledge than libraries can, and yet, they tend to be the most underestimated source for learning. Thanks for reminding us all (and me in particular) that there are good library blogs out there, as well as organizations and other resources regarding them. It is appreciable step that Sixty two libraries has hired Comedy Magician and Educational Entertainer for the kids. I think this step will develop sense in the kids to use the library. I do managed lots of files in my PC regarding to my blogging aspects. I always try to save something which i can use later. It’s a great idea to make libraries a little more “fun”. Let’s face it, most people are more concerned about feeling good than almost anything else. Let’s appeal to that side of people while keeping the atmosphere as productive as possible (perhaps by separating the noisy situation from the studious folks) and see what happens. Visiting library is one of the way to gain more knowledge.libraries are a great source of best authentic information.and thanks for your sharings its very useful for me. and i really like your artocles. its great work and thank so much for your idea. I would be incredibly sad if libraries became extinct. I have so many happy memories of going to the library, and all the great books I was able to read despite not having the money to buy them. No matter what happens with technology, I will always prefer holding a paper book in my hand. Nicole Fende would love you to read ..What if Romeo had used a dating service? I sometimes get feeling that libraries have the same books, all of them. When I was a get I used to visit and see libraries more often and they were all different, some had more science orientated books, in others religion was the main theme, or history and so on. Now it seems that all libraries I visit will have the same books, most of them new but virtually the same. But due to technology, most libraries are rarely often visited. It is really an accepted fact that students these days are basing books via internet and the availability of it is greatly made up on their homes. Not like way back years before that students meet up at a certain library. For me I still am an avid library gal. And I enjoy the ambiance there too. In our school, we are making this as a competition. Kids get gold, silver and bronze medal for the number of books that they have read during one semester. We make graphs and display them in hallways. Sometimes, we make some of the books obligatory reading and then we make quizzes about them. Kids see it as a form of competition and game, so a lot of them choose to participate. It’s about making reading books cool again. Yes I do agree. We’ll need everyone’s help to find creative ways to let the public know about all fun activities at YOUR local library. Maybe we can leverage some of this new technology in a way that can help spread the word about libraries and important of books! I love that I can connect with the audience with my magic (reading) shows and the end results is the kids will see how much fun reading is. And not to mention, they just had a lot of fun right in their local library for FREE!! I don’t think most libraries do enough to stay in touch via social media, although it is such a great way to encourage reading. James Patterson started a new site to encourage kids to read named Read Kiddo Read. Great initiative by a great author! the concept of library is finishing and everyone wants to search online where spams and wrong information is also available and right information is mixed with wrong one. your concept will helps libraries to promote itself. libraries are a great source of best authentic information. I certainly hope that libraries won’t disappear as well during this age of everything digital. There is just so much to do at libraries and people need to be more aware of all the activities that happen at your local library! Nothing can replace a good book. I love my summers, as I perform my summer reading magic shows for libraries all over New York, Connecticut & even Massachusetts. The kids love the magic and all throughout my show, the kids get to see how important and fun reading really can be. It just puts a very big smile on my face and the librarians when they see all the kids so super excited to check out books after my show! Thanks for this wonderful Blog about Libraries! So great work here supporting the local libraries. Sometimes help can be simple too. I gave about 3 boxes of books to my local library a couple of months ago. they can use these to help fill shelves and more likely for resale to keep in operation. So I would add that all book readers should support their local libraries by giving them their overflow books. Many libraries are already on reduced hours and have had their budgets cut because of the economy and many will be forced to close without imaginative promotion. 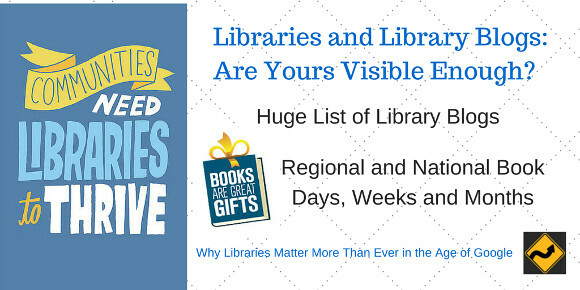 Most libraries assume that everyone knows about them and don’t do nearly enough to raise their visibility. Thank you for reminding me that donating books to your local library can be one way for them to offer more books – and just as importantly – raise money to keep their doors open. Thanks for your post as I hope to never see that day as well. Nothing can replace a physical book and the Library. There is so much you can do there! And I love my summers as I perform my summer reading shows all over New York, Connecticut & even Massachusetts! Its just a wonderful thing to see kids get so excited and motivated to read after my shows! It reminds me when I was a kid and I loved how I would magically take a journey with the book I was reading! And Yes librarians do know everything! Thanks for this post Gail, lots of wonderful information here!! I’m hoping that this post will bring even more library related blogs into the light. Did you realize that September is National Literacy Month? There is very little quality information online about it. October is National Information Literacy Awareness Month. Perhaps they will get the word out more effectively. It’s so important for kids to have access to books, it really promotes a sense of curiosity. I wonder what the future of libraries will be with everything going digital. I hope I’m not around to see the day that libraries and physical books ‘go the way of the dodo bird’. I never leave my library with less than 10 books at a time. Even though I have a Kindle I still prefer the look and feel and smell of a ‘real’ book! And you’re right – librarians know everything! What a great idea to work your ‘collaboration magic’ with libraries, Gail! I’m heading off to my local library this afternoon and I’ve always thought it would be great to volunteer some time there. I think I’ll offer to blog for them! Thanks for the great idea! I feel the same way. I remember checking out the maximum books allowed – ONLY five – putting them carefully in the double baskets on the back of my bicycle and reading them all in less than a week so I could get more. I read at least a book a day when I was young and still love books. Do leave links to any library blogs or blog posts about libraries in this post so I can add them to the post? I regularly improve even my existing content with new links. And any time you do a post supporting libraries be sure to let me know and I’ll spread the word for you. Libraries need all the help we can give them. The easy ways are to add @GrowMap to a tweet that contains a link OR drop it to me in Skype or IM. I’m the only GrowMap on Skype and leave IM open. Info on my contact tab. I think you need to focus on the parents and getting them into the library. I remember when we first started taking our kids to the new library and they were dumbfounded. They couldn’t believe that you could take these books for free and use it as much as you want. The parents need to turn off the tv, video games, computers, ipods, etc. and force kids to read. Once you start that, kids curiosity will naturally take over.